The Telling Room by Michael Paterniti was a remarkable book that went beyond what I expected from it, but was also consistent with Paterniti’s Driving Mr. Albert in a weaving together of an interesting external story with an equally compelling story of the author himself. In relation to this idea of a writer and his work, the book was reminiscent for me of two excellent memoirs, The Tender Bar by J.R. Moehringer and Far Afield: A Sportswriting Odyssey by S.L. Price. 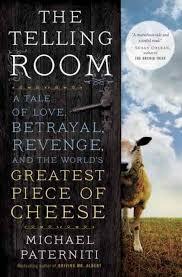 With an extended title of The Telling Room: A Tale of Love, Betrayal, Revenge, and the World's Greatest Piece of Cheese, Paterniti’s book was a great history lesson, travelogue, appreciation of slow food and epic tale. Not as explicitly spelled out in the subtitle, it also was about a way of life with family and friends, believing in someone, and storytelling… with stories told by the central character Ambrosio Molinos as well as Paterniti around his writing of The Telling Room. The book is set largely in the small town of Guzman, in the Castile area of Spain, where the craft cheese Paramo de Guzman was once made by the aforementioned Molinos. As Paterniti reached out to and then began visiting Molinos, he was exposed to the epic storytelling both common in the region and trafficked in by the former master cheesemaker. In terms of Paterniti and writing of the book, he noted early in The Telling Room that “I sallied forth; temporarily occupying whatever foreign country, then came home in the back of an airport taxi with a mess of scribbled notebooks, trying to find the narrative line in all the facts and quotes.” He additionally wrote “I returned to Guzman to see what else I might find, to gather yarn, as the journalist says, when the journalist doesn't know what the hell he's doing." In The Telling Room there was a fascinating and recurring thread about ideals and actuality. While the events and betrayals discussed throughout the book may well have been different than portrayed by Molinos, the ideals he espoused and friendship with Paterniti certainly felt real. Towards the end of the book, a shift occurs where Paterniti certainly doesn't betray this friendship with Molinos, but rather moves from simply being a part of his stories to a chronicler of them, albeit one who has created stories of his own as a writer who along with his family connected with Molinos and his narratives. Out of all this, Paterniti finished with a compelling book that covered a huge amount of ground (again, similar to Castilian storytelling) and likely would be enjoyed by anyone appreciating either writing about writing or simply an epic tale.